This Is The Story of A Driftwood Plank. Sawn from a tree some time ago, it supported craftsmen and builders for many years as they trod the scaffold until, for some reason, it was cast adrift. Some years later, the plank washed ashore in Gamrie Bay and there lay dormant until its rebirth in August 2012. 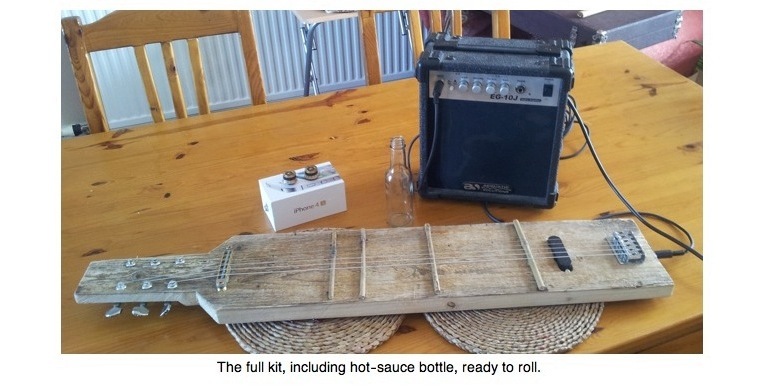 Back in the early seventies I was the happy owner of a Hofner 'Hawaiin Artist' lap-steel guitar. I used it quite a lot on the Suths first album and really enjoyed playing it. A few months ago I decided I'd like to get into lap steel again (haven't played one for years) and had a surf around to see what was out there. As I was looking for things it suddenly dawned on me that I could make one, nothing like as complicated as a guitar with a neck and all the required craftsmanship, and something I thought even I could have a go at. So I did and I'm really pleased with what I ended up with. 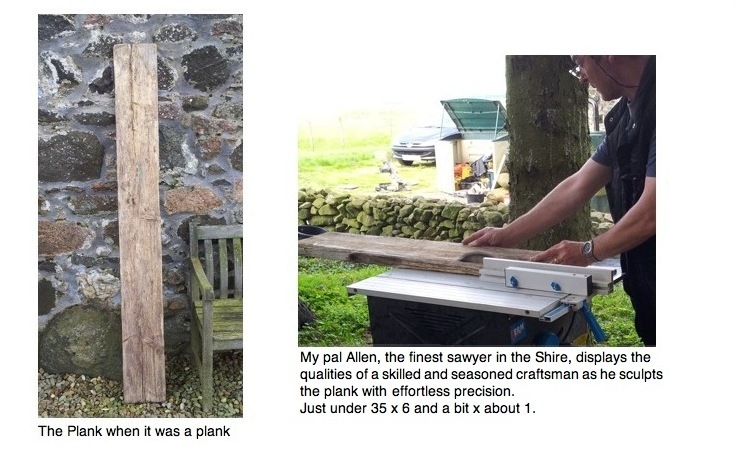 The help I got from Allen the joiner was invaluable, couldn't have done the sawing bit myself. Cheers man! Quite a few folks have emailed me with plank enquiries so I decided to put this page together to explain the whole thing. 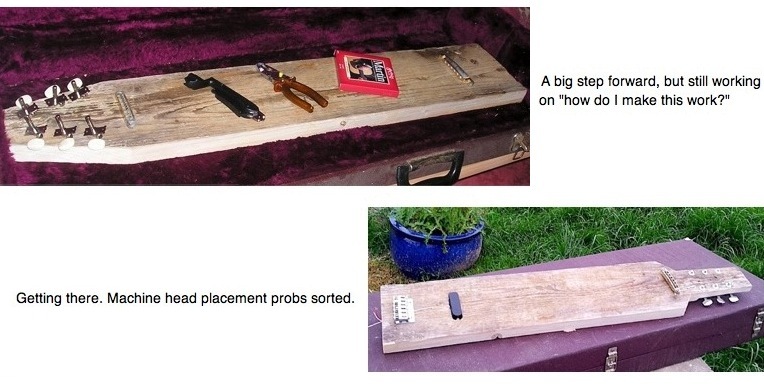 I was up at the local recycle centre one day, throwing out some old rubbish when I thought, 'maybe this is where I could get some bits for the plank? Yeah, that's it, an 'up-cycle' job, something Madame Cholet and Uncle Bulgaria would approve of." So I asked the guys there if they ever got old, broken up guitars in there. "Sometimes, we'll let you know." OK, that was that and a few weeks later I had a 3/4 scale Hannah Montana and a 1/2 scale Burswood guitar in my kitchen with all the bits I needed. A dodgy old Les Paul copy was later added to the set. I already had a kitchen drawer full of obsolete phone chargers and the like, so I had miles more flex than I'd ever need. Now all I needed was a plank. The next step came about in conversation with Allen, the joiner who was working on a house down the road. Turned out he played a bit of guitar and that, so I was telling him about the plank idea. He told me he knew a bloke in Crovie (little village a few miles along the coast, where my Gran was born) who had a fine collection of bits of driftwood from the bay. That was it, the piece was chosen and work got underway. If you'd like to hear how it sounds, I did a twilight version of Precious Memories, a tune I used to do with Terry Butters many years ago. Just me and my plank recorded on my mobile and posted up to sound cloud. ACHTUNG! SUPER GLUE ALERT! I decided it would be a good idea to put the frets on with super glue. I had some handy cos I'd just got a tube to fix a nail I'd split (top tip from a pal who knows about that kind of thing). Anyway, I was applying glue to a piece of cane but didn't realise that at the same time I was also applying glue, quite liberally, to the first finger and thumb of my right hand. Oh no! Under the tap and loads of Fairy Liquid. All that did was turn the glue green so when it dried and cracked it looked like the hand from hell. Drove, one-handedly, up to the chemist's and when I showed the young assistant my hand the poor lass nearly had a heart attack. After she'd calmed down a bit she advised me to try a pumice stone. Top tip, worked a treat. Fretting the plank was really easy once I'd thought it through. 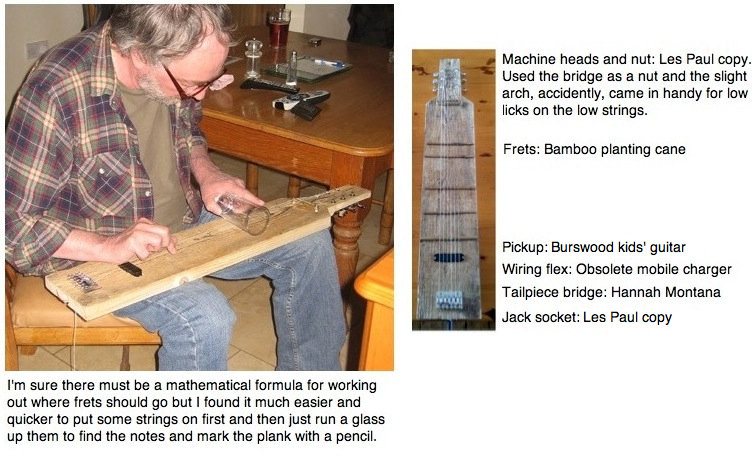 I knew the octave would be precisely half-way between a string's point of contact on the bridge and the nut. Where the 12th fret is on a standard guitar. Then running a glass up a string I found the other harmonics and notes I needed and marked the points on the plank with a pencil. (The relationship between the maths of sound-wave cycle speeds and our perception of harmonic structure is a pretty amazing subject. I studied some of that with the Open University a few years ago. Fascinating, but I know it's not everybody's cuppa tea so I'm not going to bang on about it. Wish they'd told me about things like that at school, maths classes might have actually meant something to me). OK. Let's get primitive. Lovely stuff. Debut demo recorded by an android and up-loaded to Sound Cloud. Job done!